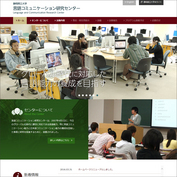 The Language and Communication Research Center at the University of Shizuoka was established on April 1, 2007. The purpose of the Center is to develop educational programs and carry out research related to the field of educational linguistics and the acquisition of language skills required in our global age. The program focuses particularly on English and Japanese communication skills.